You can see a bigger version on flickr, and if you’re interested, we’re selling the posters at the Mock Man Press store. The final poster is 24×36″ and is being printed locally in Seattle on fade-resistant inks. This was a huge amount of fun to make, and I’ll write more about it in another blog post soon, but for now: it’s done! Hope you like it! Coming soon: my comic adaptation of “The Doom That Came to Sarnath”. Please come back and check it out! Gee… this IS impressive. I don’t know how it looks from up close, but from a distance the colour balance looks really nice. I really like that bluish green colour that’s used for the tips of the mountains, on the top of the left sphere particularly. That combination of grey with cyan reminds me a lot of pixel art from the CGA & EGA eras. By the way, what sort of script is that in the middle, and what language? Does it actually mean anything? It’s Arabic text, for those who can puzzle it out! You can read and write Arabic, Jason? Mine is going into a frame and up on the wall. Hey Jason and other fans, pleased I found this website with all this amazing art, looking forward to any new comics to be released. Also the first Arabic sentence translation is: Life * Death * The god of madness * Arat-hoot, the great demon sultan (Sultan is like king) * The god of chaos sitting on his throne in the middle of the universe. The second one goes like this: The moon that reveals the secrets of the night * The location of the temple of Artamis * Eye something something (Can’t translate xD!) * The prophet of Arat-hoot * The mirror of horror. Ma sha’allah! Thanks for translating the Arabic text! :) I’ve been studying Arabic for awhile and so I wanted to include some in the poster since Lovecraft was inspired by the 1001 Nights (and various Orientalist stories). I had a native speaker proof the text, so I’m glad it’s correct. There’s a tiny bit of Arabic inside the book as well. I’m a Lovecraft fan but I just find your website. 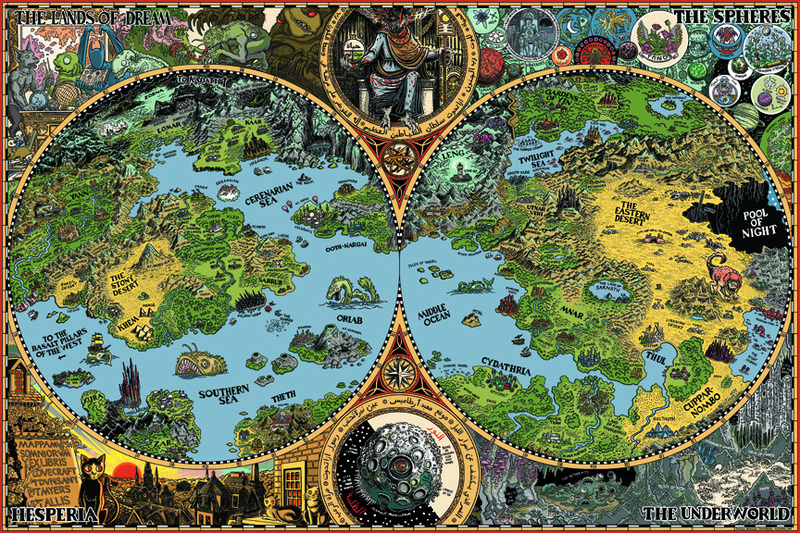 I do know of several maps of HPL’s Dream-world, but yours are awesome — including the sketches! Hey, Jason! Huge fan of your comics and artwork. I’m just recently getting into the works of Lord Dunsany. Can you possibly point out which places from his stories have been included in this map? I already own one of your Lovecraft maps but if I buy another one directly from you will you sign it if I pay extra?